We are in the process of restoring the historic Edge Hill Service Station into our headquarters, known as the Center for Archaeology, Preservation and Education (C.A.P.E.). You may know the building, situated at the corner of U.S. Rt. 17 (Main Street) and Rt. 14, but its function will be all new, serving as an educational and preservation center for the entire Middle Peninsula region. The Fairfield Foundation has been doing archaeological research and educational outreach since 2000, but opening the Center will allow us to broaden our reach and our programs, helping to bring the wonder and richness of our history to the forefront. We are excited about the possibilities and look forward to moving into the building in the fall of 2017- but we need your help! Edge Hill Service Station as it appeared in the 1930s. 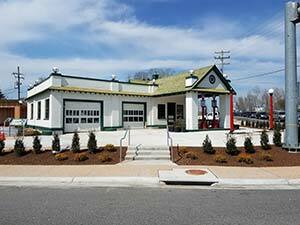 The multi-year process of restoring this 1930s historic service station has taken a lot of effort and significant financial support. You can see some of the progress we have made, with a lot of your support, as you drive by the CAPE, but we need to finish the journey. If you can help in these efforts to bring our history to the forefront and transform this building into a vibrant center for preservation, please donate now, or get in touch with us about how you can help with particular aspects of the project. How are we transforming this building? The 1930s Edge Hill Service Station retains much of the original lighting, window, and door hardware, including metal-framed windows in the garage bays and reception area, daisy glass in the bathroom windows, and interior light fixtures. Inside the building, our restoration will take advantage of the industrial qualities of an early 20th-century service station. After peeling away modern changes, we will adapt the space to suit our educational efforts, including office, lab and exhibit space, while updating electricity, central air and plumbing. At the same time, we are transforming the building into a modern, energy-efficient space, including the use of solar panels, high-efficiency heating and cooling, and potential LEED certification. The solar panels are already up and running, generating energy and revenue for us as we complete the remaining restoration work. 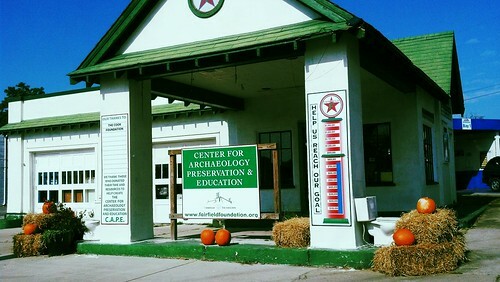 With your help, we can create a Center for Archaeology, Preservation and Education that will serve the entire region! Individual donations always form the backbone of a community preservation project, helping us hire local businesses and restoration experts to ensure that this restoration is authentic and built to last more than a few lifetimes. Your donation is not only tax deductible, but it will also leverage other donations through matching grants and rehabilitation tax credits available through the state government. Please click on the Donate button below- your help will go a long way! If you are interested in sponsoring a particular part of the restoration, naming opportunities, or in-kind donations, please email us at Fairfield@fairfieldfoundation.org. There are other ways to contribute, too. You can volunteer your skills to help with the restoration, donate supplies, and involve your business in the project. You can also volunteer your time on our fundraising and events committees, help write grants or plan restoration workshops. If you have a special skill, such as painting or carpentry, we have a place for you. Every contribution is important. 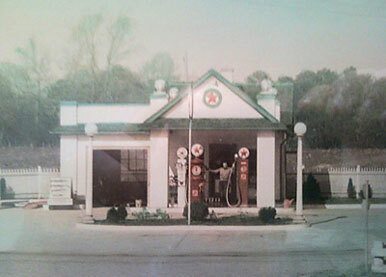 Restoring a 1930s service station to its original grandeur is no easy task. The project will take significant time and funds to complete. But our goal is to make this a part of the community—a Center for Archaeology, Preservation and Education that will be a lasting symbol of the pride our community shares in its history.